Williamsport and Lycoming County have contributed many outstanding men and women to the field of public service during the years at the local, state and federal levels. One of the most distinguished of these was William Fisher Packer, who served as the 14th governor of the Commonwealth of Pennsylvania. Packer is the only Lycoming County resident ever to serve in that high office according to an article by Eugene Bertin in “Now and Then,” the journal of the Muncy Historical Society. Packer was born on April 2, 1807, in Howard Township, Centre County. He went to Sunbury at the age of 13 to learn the printing trade from a relative who owned a newspaper. The paper lasted for only a year, and when the business folded, Packer went to Bellefonte to complete his apprenticeship with another newspaper. In 1825, Packer went to Harrisburg to work as a journeyman printer at the “Pennsylvania Intelligencer,” published by U.S. Senator Simon Cameron. In 1827, he came to Williamsport and studied law in the office of Joseph P. Anthony, but never was admitted to the bar. Packer soon became very prominent in various local civic affairs. He became one of the first-ever school directors of the Williamsport School District in 1834. He was an advocate for internal improvements for Lycoming County. He was very active in the drive to build the West Branch Canal. He was named the superintendent of the Lycoming Division of the canal. He was appointed by then Gov. Porter to be one of three canal commissioners in the state, and in 1842 was appointed the state’s auditor general. Packer was instrumental in incorporating the Williamsport Division of the Pennsylvania Railroad to operate between Williamsport and Harrisburg in 1852. 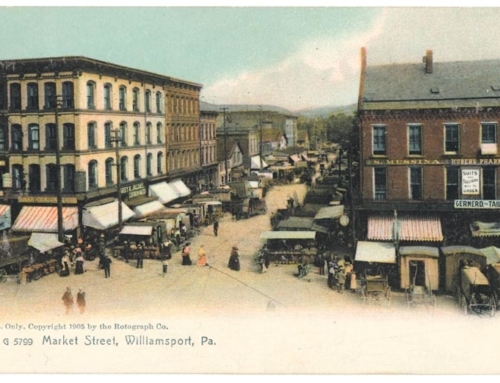 He was one of the original investors and officers of the Williamsport Gas Company in 1856. He was elected to the Pennsylvania State legislature in 1847. Surprisingly, he was elected Speaker of the House during his first term in the General Assembly. He was re-elected to the legislature in 1848 and named speaker again. In 1849 he was elected to the State Senate, defeating Andrew Curtin, who, ironically, would succeed him as governor in 1860. He was very active in the high counsels of the Pennsylvania Democratic Party and was delegate to the 1836 Democratic Convention that nominated Martin Van Buren to succeed Andrew Jackson as President of the United States. Packer was a close associate of James Buchannan, who later became the 15th U.S. president, and who used his influence to advance Packer’s political career. It was largely through Buchannan’s influence that Packer received the Democratic nomination for governor, beating out David Wilmot, author of the “Wilmot Proviso,” the Republican Party’s first nominee for governor, and Issac Hazlehurst of the Nativist Party, that was a vestige of the old “Know Nothing” movement. Packer won the governorship by over 14,000 votes and became governor in January 1858 – a time in which this country drifted towards Civil War. Packer differed with his political mentor, Buchanan, on the slavery question. He also noted with dismay Buchannan’s inaction as the southern states started to secede. Packer was the first governor to occupy an official Pennsylvania-owned Executive Mansion. Packer’s wife and “First Lady” was Mary W. Vanderbelt, daughter of Peter Vanderbelt, son-in-law of Michael Ross. She lived until 1890. Packer returned to Williamsport after his term of office ended in January 1860. He did not seek re-election because of ill health. He remained one of Williamsport’s most venerable citizens until his death on September 27, 1870. He was buried amid pageantry and honors with participation from Packer’s Masonic Lodge and from various Lycoming County militia units. He was laid to rest in the Williamsport Cemetery on Washington Boulevard.